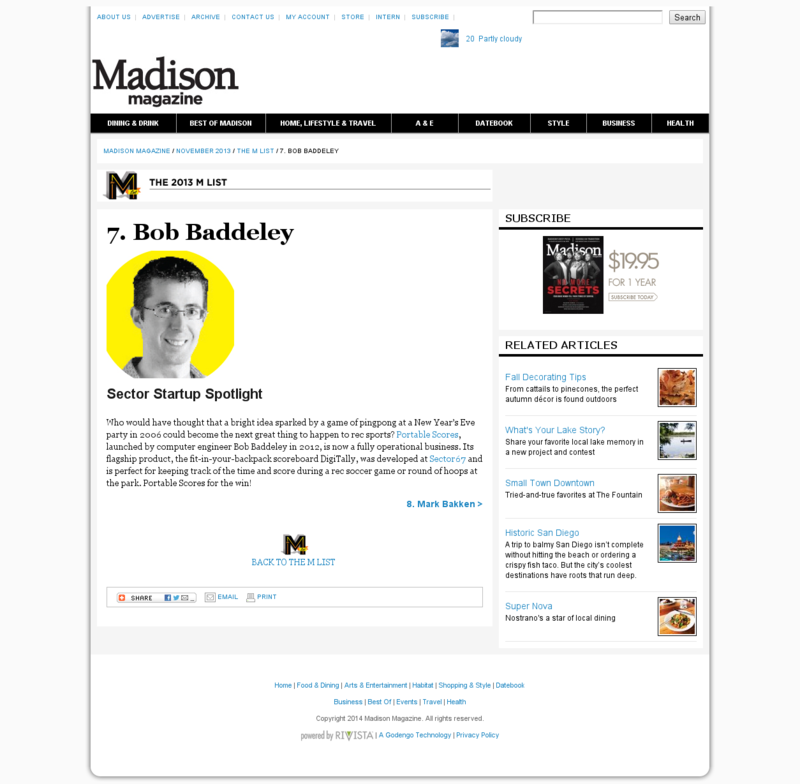 Bob Baddeley was selected for the Madison Magazine M-List in November 2013. Bob Baddeley was invited to speak at TEDxMadison on June 1 about manufacturing and the lessons he learned after spending 3 months in China and then manufacturing in the U.S. anyway. The video is now online, and if you can be patient with the cuts for the first few minutes (you can just listen to the audio for the whole thing if you want), then you can see the whole presentation. This post is about my attempt at a technological solution to gun problems. I built a working prototype, but ultimately I believe that this is not a solution to the problem of mass shootings. There is no technological solution that will prevent someone who is sufficiently motivated from doing significant harm yet still afford us the freedoms that make us human. However, what I built can help prevent people from harming others with weapons sometimes. It has some legitimate circumstances in which it could be very effective. Full disclosure: I was contacted by the author and sent two copies of this book. Despite a slightly misleading title, this book is definitely appropriate for anyone whose business involves China in any way. Selling To China is about dealing with people and understanding their motivations and the way things work. Stanley Chao starts by making a distinction between two types of people in China; those that he calls the Mao Generation, and the newer more Western generation. The Mao Generation are those that are older and have had a lifetime of experiences completely different from Western civilization that have influenced everything about how they act and do business. The newer generation is educated in Western business practices and their mindset makes sense to Western business types. Because their psychology and motivations are similar, and because they often speak English and don’t put so much emphasis on cultural heritage and are more interested in forming long lasting positive business relationships than making a quick buck, and because this generation is still young and only slowly integrating into the factory and corporate leadership, Stanley Chao doesn’t put so much emphasis on this group for the remainder of the book. Instead, he focuses on dealing with the people who do own the factories and do have influence; currently the Mao Generation. A consultant, Stanley has seen his fair share of horror stories, and he shares many. As a businessman who has been to China for manufacturing, I can identify with and confirm some of them. The book addresses many of the topics that are of concern for a lot of businesses looking to have stuff done in China, and highlights some of the common mistakes and possible problems that occur when two distinctly different cultures try to communicate and do business with each other. If you have already decided to go to China this book will help, but it will not tell you why you should or what factors should help you make the decision. After hearing many of the horror stories and challenges that make pursuing China challenging, this book left me more informed and aware, but certainly didn’t remove the nervous pit in my stomach that you will probably have all the time. This book might be a manual for a zebra in the African Savannah; there are lots of things that will eat you but as long as you know about them you can keep your eye out and react when you see the signs. If you are traveling to China either to outsource manufacturing, source parts, or even try to tap into the billion potential customers, then this book has valuable information that is easily worth the cost of the book and the time for this quick read. Initially, I was very excited about adding wireless capabilities to my product, and I was even more excited to find a plethora of available solutions in China. I could get any kind of remote, receiver, transceiver, encoder or decoder, FSK, OOK, ASK, in any frequency band 315MHz, 433MHz, 900MHz, 2.4GHz, at any power level. I found someone who had a remote with six buttons, which was exactly the kind of remote I needed. They had a matching receiver module, which had the decoder for handling the transmitted signal. I was even able to hook the receiver up to my product without any changes to the microcontroller firmware; it integrated directly into the same circuit as the rest of the buttons. And I contacted the manufacturer of the remote and was told I would even be able to customize the printing on the buttons and change the color of the remote. It was a perfect solution. Ugh, just found out the meds I ate have lead in them from the doctor I visited today. China got me good, once again. There are many kinds of ways China will kill your body. Let’s examine a few. These are the problems that aren’t specific to China but rather are likely to befall anyone who travels to a foreign country. There’s diarrhea, flu, jet lag, and adjustment to climate (such as going from a colder region to the tropics). It’s hard to blame China specifically for these issues, but they do need to be mentioned. Some food is fantastic. China definitely knows how to do things right if you happen upon the right restaurants. Unfortunately, sanitation standards aren’t very high, and it’s common to get food poisoning from street vendors. But it gets worse than that. The fakes about not just in electronics but in food as well. The recent scandals on gutter oil and fake pig ears have rocked China and disgusted the world, and those are the ones that got caught. There’s really no way of knowing your food is safe, so you just hope it’s been cooked long enough and your gut has the fortitude to take it. This merits a whole heading. With motorcycles driving on the sidewalks, running lights constantly and driving in the wrong direction, and in general the whole of China only having a couple decades of driving experience, I sometimes wonder if I should be wearing a helmet while walking. The only safe place is the subway, because the trains have the least likelihood of being where the pedestrians are. Manufacturing takes a toll on the environment, and in China there’s a lot of it. On many days it’s not unusual to only be able to see a block or two in the big cities. That’s a lot of particulate matter in your lungs, going to town on your respiratory system. And the awesome part is that there’s nowhere you can go to escape it. There’s no ‘breath of fresh air’ to be had. Running is harder, stairs are harder, and your lifespan is probably shorter every day you are there. On the plus side, it doesn’t feel like such a big city when you can only see a bubble two blocks wide. I couldn’t think of a better name for this category. Besides watching out for the things that seem almost understandable, there’s a whole category of dangers that make no sense at all and make you wonder if China has some great conspiracy and everyone is involved. A friend had a massage, and it turned out that having ears cleaned is a common step in this service. Instead of using soft tipped things, they use a pointy stick, and they go deep. So deep that she was bleeding from her ears and a trip to the hospital revealed that her ear was scratched, but her eardrum was not damaged. Eastern medicine is another category of strange practices that are probably more placebo than solution because they didn’t work for a skeptic like me. The motivation behind this post is my friend being prescribed pills with lead. There may be some legitimate reason, in the same way that chemotherapy is legitimized, but I’m not quite ready to give China the benefit of the doubt here. Hacks abound, too. The kind of hack that has high voltage lines taped to walls and heavy objects suspended precariously. It may work for now, but everything you see or use is a disaster waiting to happen. One of the purposes of this blog is to inform engineers traveling to China about the things they are likely to expect. To summarize, expect to get sick, and expect to get hurt by something completely unexpected. China can mess you up, and will be unapologetic doing so. China is fraught with fake parts, but that’s not always a completely bad thing that will ruin you. Sometimes it’s something that will save you lots of money because it works well enough for your needs and is readily available. Two of the components for my product (the DigiTally, a portable electronic scoreboard) are DC/DC voltage converters (one at fixed 3.3V for the microcontroller, and one at 9V for the LEDs). The parts are pretty simple and do the job well. They are made by National Semiconductor and readily available from Mouser at $2.70 for 1 and $1.17 for 2500. This is for the LM2575 3.3V SMT part. In Shenzhen, I asked for an LM2575 SMT component, and they rushed off to find my part, returning shortly with it and charging me only about $0.40 for each. The component was pin compatible, with the same footprint as the National part. It worked exactly the same. I didn’t need to modify my design, and I had managed an enormous savings off the cost of my product. It was awesome. But there was some cost. There are no datasheets for this part. I can’t even figure out what company made it. I looked around for datasheets for other variations of this part and found that there are a few, and that they sometimes have slight changes in the recommended values of nearby attached components. This is slightly disturbing because it means I may not be using the right values for components, but I have no way of knowing. It is essentially a small black box that does what it is supposed to as far as I can tell, but I don’t have the information to back it up, meaning there is some risk in my design. I don’t even know if these are legitimate parts or if they are rejected defects or expired. It’s a gamble. The other challenge is finding these parts in the first place. I got lucky (maybe) to find this component, but what about my other components? There is no way of knowing if there are other parts that can be legitimate cheaper alternatives to the name-brand components I’m using now. There is no Mouser or Digi-Key for Chinese manufacturers. I’ve found that cheap resistors abound. I can get SMD resistors of any value for essentially free ($0.002 each). But when I ask for name brand parts, the price jumps to comparable to, or sometimes even higher than, Mouser. There are two lessons in this. First, that China can be a source of extremely cheap parts and significant cost savings on components. But second, that because it is so hard to verify the provenance of these parts and their specifications, there is some risk in using them, and it may be better for critical components to use name-brand parts with clear datasheets and support. At the electronics market there are lots of booths of people selling iPhone cases, USB thumb drives, cell phone trinkets, and other useless but high margin plastic things. They prey on the thousands of visitors from around the world who are there to get useless “Made In China” crap for their families or get ‘amazing’ deals on electronics. There is no need for warranties or money back guarantees; most people will not be returning for quite some time, and those that would know better. As it was one of my first days, and in the interest of recording for posterity, I allowed myself to fall victim at one of these booths. A tray of unpackaged microSD cards caught my eye, and I asked for one of the 16GB ones. Initially the price was over $20, as communicated through the large button calculators at every booth. Clearly this was not competitive with even Amazon, and I was not a fan. She chopped the price down to $10, but I wasn’t having that, either. Walking away is the first trick in lowering prices, and I played that card, quickly getting a call to return. 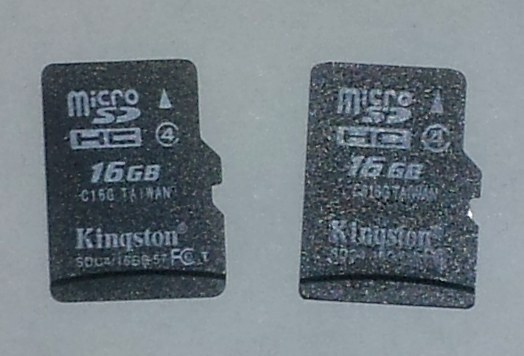 Then I played the second card, which was asking for a second one, but at a discount on each, bringing the total to $15 for 2 16GB Kingston microSD cards. She hemmed and hawed, but ultimately accepted when I started to walk away again. Success! My first negotiation at a booth, and I had achieved more than 50% savings! The fronts of the cards look legitimate. The back of one of them even has an authentic looking sticker that says “Made in Taiwan.” It HAS to be good, right? The thrill faded when I discovered some things about these MicroSD cards. 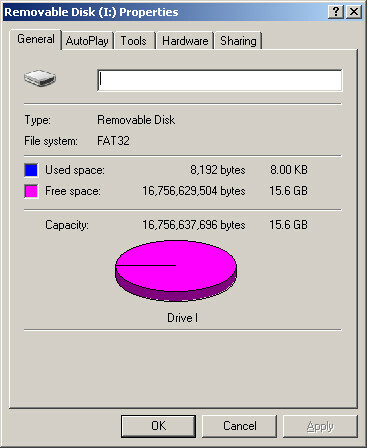 I put it in my laptop (my China laptop that had been formatted prior to arriving in China and would be separated from my home network, and I formatted the drive immediately) to check it out, and discovered that somehow these MicroSD cards had figured out how to be extremely efficient with data storage, because though it was formatted in FAT32, it only took 8kB of storage after being freshly formatted. It should have been much more than that. 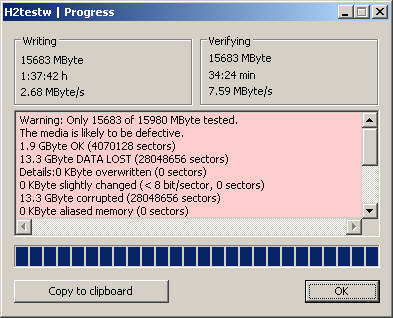 Have you EVER been able to get a full 16GB off a microSD card? No. Except this time! Huh. Well that’s not good. So my 16GB drives were actually 2GB drives with different labels printed on them and the firmware rewritten to report as 16GB? Or maybe they were defects that should have been destroyed? Anyway, they were bad. I don’t blame Kingston. I knew they were sketchy, and I knew I was taking a risk, but it does serve as a cautionary tale. When manufacturing in China, you need to be extremely aware of fake parts. 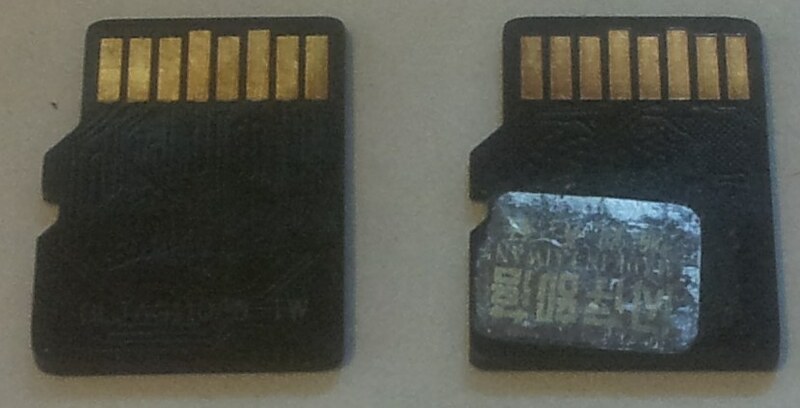 It turns out I’m not the only person to have experienced this problem with MicroSD cards as well, and Bunnie Huang did an excellent investigation of this issue. Any part you purchase could be fake, could be rejected parts, or could be parts that are old and exposed to too much humidity or have oxidized and can’t be sold to discerning customers. The problem goes the other way, too. Any product that you produce could quickly become a fake, retailed as if it were legitimate in shady markets. Your defects that should have been reworked or destroyed somehow make it out into the real world, and then support requests are made on products that never worked right to begin with and shouldn’t have made it into the market. This happened with Mitch Altman, inventor of the TV-B-Gone, who started getting support calls for his product, and after significant investigation discovered that someone else had copied his product entirely, down to the contact information, but unfortunately didn’t do as good a job at building the product. When this sort of thing happens, it takes away from profits, but it also pollutes the brand with defective products and potentially unknowing customers, who then have a negative experience with the brand. It’s a wild world, and it’s hard to tell what’s real and what’s not. Quality control is essential and challenging, but there are people with no scruples who will destroy it anyway. It’s challenging to keep fake parts out of your products, and it’s nearly impossible to prevent your product from being cloned, poorly. The cloners will replicate everything, including the packaging, and there’s very little you can do about it. You just have to do the best you can, and as long as the clones aren’t happening in your market, don’t stress so much. Also, don’t source your components from disreputable sources, and NEVER buy a MicroSD card at the electronics market in Shenzhen. 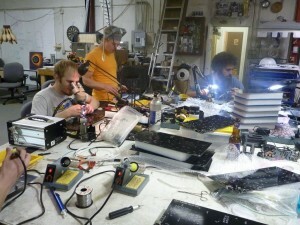 Sparkfun has an interesting article on something they call, the “pit of despair.” It’s the point of volume production where you’re more than you can make easily at home, less than you can go directly to a contract manufacturer, and right at the point where you’re not making enough money to quit your day job but you’ve committed yourself to a lot of work. It’s an awful place to be. The problem with small hardware startups is that it’s all too easy for them to get into this space. They start off making prototype units, selling them at a loss or tiny profit. Then as they scale up with glimmers of mass production in their eyes they hit this pit along the way, where they can’t afford to get a factory and their volumes aren’t high enough for one anyway. They’re stuck, and quality suffers, and there’s no time to do development to improve the product. The only way out of the pit is with a large infusion of cash or popularity (which brings with it cash). At a soldering party at the Sector67 hackerspace. The Pit of Despair enjoys company. A surprising amount of products fall into the third bucket. I call this bucket the pit of despair. These products get far more attention than the creator(s) expected. The product was well-designed but may have been designed for kitchen production, where they planned to build tens of units. When demand grows beyond thousands, the creators are often forced to make tough decisions: the income may not be enough to release them from their day job, and the amount of time required to build the product begins to gobble up evenings and entire weekends. 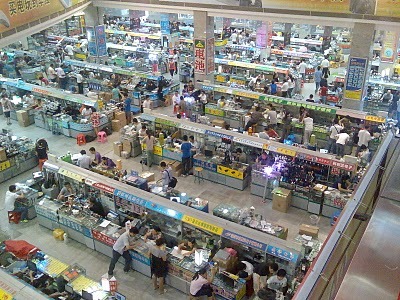 Occasionally I get contacted by other people in or near Shenzhen who have also written about the craziness that is the Shenzhen electronics market. Here’s one such post. Mitch Davis has an interesting perspective about forming lasting relationships with people and how important it is to get a foot in the door and build a long term partnership with suppliers that will save more money in the long run than shopping around for the best price at that moment. One way to overcome this is to get an introduction from someone already doing business with them. The sociological theory is that neither side is unlikely to do anything stupid (like cheat) to the other, because it would reflect poorly on the introducing friend. And to put someone in a situation which makes them look bad is something you just don’t do in Chinese culture. Read the full article for an interesting story of bootstrapping those relationships.